One of the most basic needs of runners is sometimes overlooked and often underestimated i.e. keeping the body well hydrated. Staying hydrated is critical to running performance as dehydration may lead to fatigue, decreased coordination and muscle cramping. What, when and how much to drink are the most common questions asked. Going back to basics, muscles only use approximately 25% of the energy for the work being performed (not the most efficient system); the remaining energy is released as heat. This heat is transferred to the blood, the blood flow to the skin is increased and heat is lost by evaporation, otherwise known as sweating. Sweat is generated from the water in the blood. The simple rule is to replace these lost fluids to prevent dehydration. It can be normal to lose between 0.5 – 1 litre of fluid per hour whilst running, even when the weather is cool. Dehydration has a big impact on performance with some experts’ suggesting a 1% drop in body weight causes a 5% drop in performance. To put this in perspective a 70Kg person losing 1 litre of moisture through sweating reduces their weight by 1.4%, this could cause a 7% drop in performance. 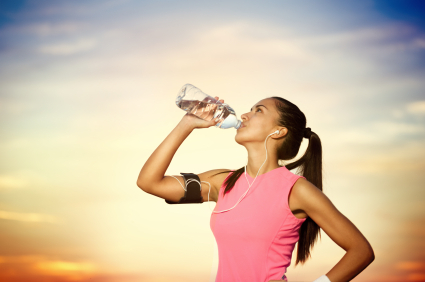 Drinking water at regular intervals whilst running will help prevent dehydration. A good indicator of approximately when to take on water whilst running is to look at where drinks stations are positioned in most races i.e. approximately every 5km. In summary, it is advisable to start any running session or race well hydrated. Drinking 300-500ml of fluid about 15 minutes before a workout is considered good practice. During the session aim to drink 150-250ml every 5K/20 minutes to offset fluid loss. Drinking “little and often” can minimise stomach discomfort. N.B. the more you sweat, the more you need to drink. When the session/race is over, it is necessary to drink. Experts’ advice is to drink about 1.5 litres of fluid for each kg of weight loss. Never having a set of scales near the finish line, common sense should be used and drinking sufficient is well advised. The evidence that dehydration doesn’t exist is when you pass light-coloured urine. GR8running provides 1:1 or group coaching and personal training plans to runners whether new to the sport requiring initial guidance/support or an experienced athlete wanting to take their running to the next level.